Things get a little sketchy when the team behind Edmonton’s hottest sketch troupe, Don’t Not Talk To Strangers, swing by Living Room Studios for a chat and to share a pair of their sketches. The crew talks about the process behind creating a successful comedy, where the root of comedy lays, and stamp factories. Plus, we plug some local arts happenings and get into a rousing (fixed!) round of The Good, The Bad & The Ugly Advice. Get this funny freakin’ ep in your ear holes! Fringe Artists! We Want to Interview You! 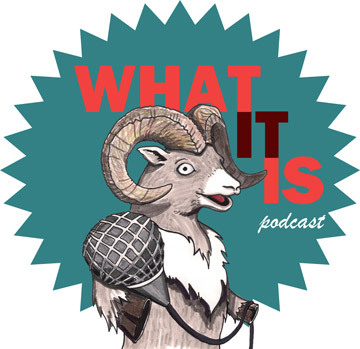 What It Is Podcast is Edmonton’s Award-Winning Arts Interview show dedicated to promoting the artists who live and visit our theatre-crazy-city. We have a dedicated listenership of arts-lovers in the city and many look forward to our huge collection of interviews to get to know the artists of Fringe and to help them pick shows they might want to see. Get interviewed by What It Is Podcast as part of the Fringe! HOW: Interviews are done a FIRST COME, FIRST SERVE basis. Arrive at the tent, look for the dudes with microphones on a high table, check in and chill out! Recording with each guest will be approx. 5mins. We only require one or two reps per show at a time. Please do not send multiple people to discuss the same show at different intervals. These interviews will be collected, edited into hour long episodes and released on Monday August 21, Tuesday August 22, and Wednesday August 23. They will be available on iTunes and other podcast apps on our feed “What It Is podcast” and whatitispodcast.com. Be prepared for a loose and casual conversation about your show. It would also be great if you could bring a copy of your handbill so I can read the information for our listeners and keep it for our records. You will also be encouraged to give your short elevator pitch during the interview. What will you find in this new ep? You’ll find a lively, serious, silly and energized discussion about Common Ground Art Society’s latest edition of Found Fest – a site specific/sympathetic/generic festival celebrating theatre and performance right in your hood! Taylor chats with Artistic Producer Beth Dart who is in charge of getting this fest together and artists Julie (NuiBoi) and Lady Vanessa about their inclusive and personal new pieces of theatre happening in spaces you’ve totally been to. CTT is in the hizay, #theatremari stops by, and we even squeeze in a round of Good, Bad, Ugly Advice. Get this ep in your ear holes and take in Found fest 2017! The What It Is podcast team proves that theatre is their expertise in an ep covering two theatrical presentations currently playing in Edmonton including The Citadel Theatre’s Peter and the Starcatcher & U of A Studio Theatre’s World Premiere of Bright Burning. We have two new guests in Farren Timoteo & Andrea Rankin who are tracked down at The Citadel to discuss how theatre can be pretty special when it’s left simple. Then, returning to the show is Colleen Murphy who talks to Taylor about her big 12 person world premiere play at the University of Alberta. There’s lots of great chatter about art, life, and the amazing work of our local artists so get it in your ear holes!